Paris is renowned for its street art, from Space Invaders to les chats. Mademoiselle Maurice adds her own spin: origami. Maurice’s gorgeous installations are alive: experience them while you can, before they decay. 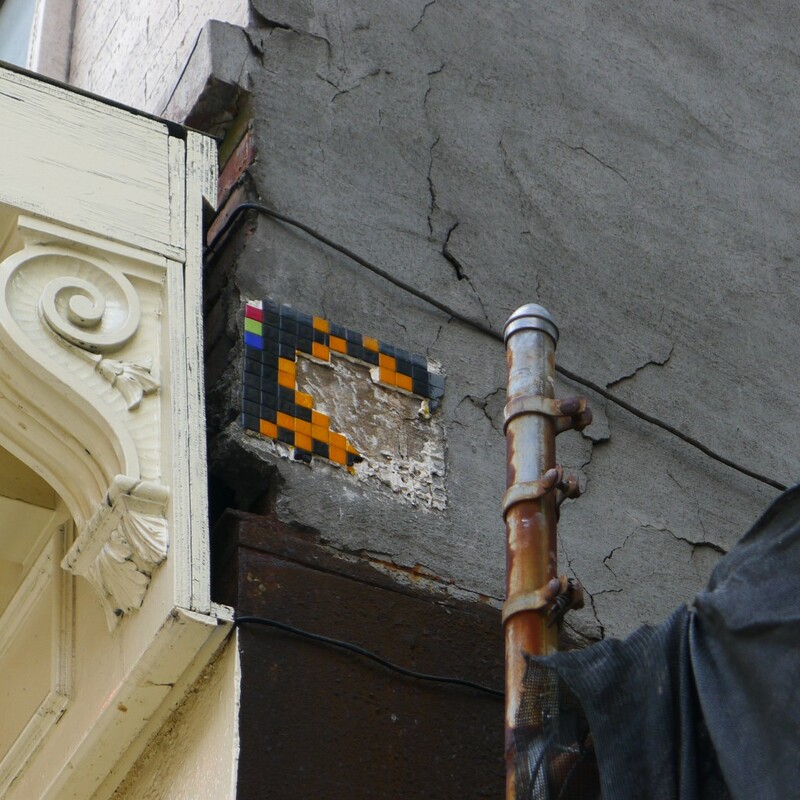 Art is part of a city’s ecosystem, and this sort of work points that out perfectly. I saw a bit of stencil graffiti in Haifa, which at first looked like Mr. Spock’s hairdo. I could only read one word of the slogan beneath it: אהבה (ahava = love). The image is actually an open heart. I’d see the same image repeated all over Haifa, and then again once I got down to Tel Aviv. I began taking photos of heart image, and asked my second (or third?) cousin, whom I had only just met, what it was.She laughed and explained it to me: It’s part of Love Revolution, a movement to promote personal responsibility for peace and happiness. If this seems goofy, it’s only because you’re not in the Middle East as you read it. My cousin was laughing because she’s one of the artists who has been promoting the project. Well, not everyone is on the love train, obviously. Some of the Love Revolution stencils were defaced or altered (I can’t read what they’ve been changed to say), and some competing images and text have also been thrown up. It’s as if Tel Aviv is having an argument with itself on its walls. 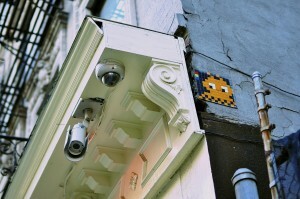 As you can see, CCTV cameras are completely useless at spotting Space Invaders. BLU Goes big on a Madrid building, using construction equipment to throw up a massive illustration depicting a circle of suited pickpockets. I heard that the mural is called “Stuffing Each Others’ Pockets”, which would imply that the suits are in a closed economic loop of another kind. Check out more of BLU’s wall work.